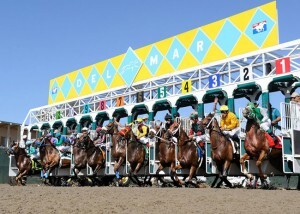 Weekend Handicapping Del Mar Saturday, November 15, 2014: Last weekend Del Mar kicked off its “Bing Crosby Season” which is on a 15 day run offering fans many special events with lots of Thoroughbred racing action including $2.25 million in stakes purses. Cards of eight races will be run most Thursdays and Fridays with nine-race programs for the Saturday and Sunday cards beginning at noon. Saturday is headlined by a reggae festival with the band Iration playing, which is included in a “College Day Tailgate Party” with all college students getting in free at Del Mar. This Saturday the 15th is headlined by a reggae festival with the band Iration playing, which is included in a “College Day Tailgate Party” with all college students getting in free. On Saturday, November 29th, there is the Craft Beer & Cider Festival also at the Seaside Stage area. After the races the band Cake will be performing who is hands-down one of my favorite bands and if I weren’t dogsitting that weekend, I’d be over there in a heartbeat. SO bummed. November 22nd is the “Fall Food Truck Festival” with more than 30 trucks from the San Diego and Orange County area represented. All fans will receive a Bing Crosby Season blanket that afternoon, done up in the tracks black and cold fall color scheme. 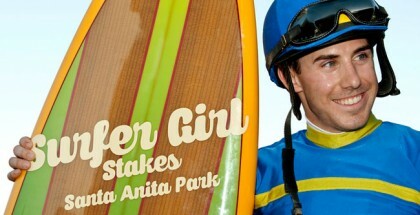 There is much more going on so feel free to check out the site sdhorserace.com for more information. 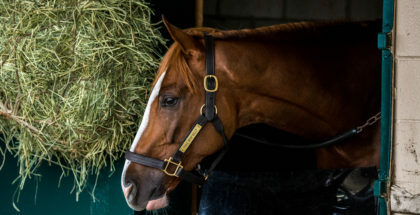 Sigi and I are going to take a crack at Del Mar this weekend ending with race #8, the Del Mar Bob Hope Stakes (GIII) $100,000 for 2-year-olds running 7f on the all-weather track. We will be including 2 races prior, #6 and #7 in addition and go our usual toe-to-toe for some fall fun racing picks. I’m starting with the Colonel John kid here Cadet Roni who was third in her first start where she bobbled early but still earned herself a nice 81 speed figure going 5 1/2 f on the dirt. She has a very nice 4f work in 46 and change on 11/8 and the rail is winning at 18% clip. She has Fernando Perez riding again. Megyns Gold is tossing the blinkers and gets Baze up again for her fourth start. Her first two starts were at Del Mar and she finished 2nd twice on the synthetic. She’s the speed and will try to wire for trainer Cody Autrey. I like the first time starter American Sun out of Leroidesanimaux. Her dam has 3 winners from 3 starters and Kitchingman is 20% trainer on the all-weather. She gets hot jockey of late, Pedroza in the irons. Prettypreciousheir also looks good as a first time starter with her dam having 8 winners from 9 starters. This Leandro Mora trained Wildcat heir baby has Bejarano up and a nice pedigree for the sprint distance. Doesn’t hurt Mora has a 25 % trainer stats for the all-weather track. Will use if there is a scratch. Going with a few who lost to Boozer a few back in this race. First off, I like Mr. Lexis for the Miller barn. The Badge of Silver guy has been trying to win here in the U.S. for a few months. His best race was at this distance on August 31st where he was 3rd behind Boozer where he came out around Toledo Eddie and just missed the place. He’s won going 1 1/4 on the turf in South America so here’s hoping he hits at some juicy odds. Next will be Toledo Eddie who fought back hard at the rail to come in second behind Boozer on August 31st at Del Mar. This will be his second race, last out Oct. 31st at Santa Anita, Breeders’ Cup Day he was third and lost by a nose for the place going 7f on the dirt. Van Dyke rides again who was up last 2 times at Del Mar. I’m torn between Eddie’s Turn and Presenceofagenius. Nakatani is staying on Eddie’s Turn over Presenceofagenuis, who is coming in off a 7 month layoff after the claim from the Mark Glatt barn for Hollendorfer. Hmmmm. Eddie’s Turn also won last out so he may be fired up with some confidence. May use one or both if there is a scratch. Diamond Majesty moves up in class and this Lookin At Lucky boy is ready to roll. He broke his maiden last out going 6 1/4 F on the turf October 29th at Santa Anita. Has a nice pedigree and should improve 2nd start since the layoff. I like the turf to all-weather angle and he gets Pedroza up. Alright Alright (Alright) yes I like him as well. Gets Van Dyke up and has some killer speed and won going 6f his first time out October 25th at Santa Anita. Will use Prime Engine in my p3 as Sigi really digs him and coming from Emerald Downs to SoCal or AZ is often a plus. The warmer climate seems to help these Northern horses run better and he doesn’t need much to run better either. I’m going to play a $.50 pick 3 starting Race #6: 1,4,2/1,2/3,4,6 for $9.00. and a $.50 p3 starting race #5: 1,4/1,4,2/1,2,3,9 for $12.00. So a total bankroll of $21.00. American Sun is a filly with an interesting pedigree, since her dam and second dam produced solid runners. Also the Leroidesanimaux progeny likes the poly. Prettypreciousheir looks like a good sprinter, and Bejarano is a sign of confidence. Megyns Gold has the experience and will try to win gate to wire. Mr Lexis is ready to roll; after some bad races, he started to improve and now according to his workouts will be very tough to beat. With Victor Espinoza in the saddle that’s a plus. Husband’s Folly is in good shape and has a good post position. If he gets a clean trip, he’s dangerous. Despite the outside post, I like Play Hard to Get because his pedigree is all turf and Desormeaux is very good in turf races. Prime Engine has been winning very easily at Emerald Downs and he looks like a serious horse. If he runs like he works, he’s the likely winner of the card. Alright Alright is a speedy horse, and the best thing is that he won in his debut, despite his trainer, Darrell Vienna is not good with first time starters. Good luck to everyone this weekend, have some fun and enjoy the beautiful fall weather. Thank you Sigi for adding your picks and plays.